THE ABORTION RIGHTS CAMPAIGN (ARC) has said that the Protection of Life during Pregnancy Bill 2013 is not sufficient to alleviate their concerns and they “cannot support” the legislation in its current form. In a statement released this morning, ARC said that the bill does not protect women’s lives and does not establish safe and accessible abortion in Ireland within the terms of the Supreme Court X Case ruling. The campaign has specifically raised issues about the possibility that women who self-administer the abortion pill may be subject to criminal prosecution and subject to a 14 years in jail. Speaking this morning, ARC spokesperson Sinéad Redmond claimed that the bill would not satisfy the European Court of Human Rights judgement in the A, B, and C versus Ireland case which asked the government to clarify the laws on abortion in this country. “This Bill won’t satisfy [that] as the ‘chilling factor’ of criminal sanctions for patients and doctors remains and will serve to dissuade doctors from offering life-saving terminations,” she claimed. “When doctors are forced to hesitate and check the law before providing treatment to a patient, it’s clear that the law protects neither patient nor doctor. Redmond also said that the “estimated thousands of women” who self-administer the abortion pill every year will now be in danger of risking jail sentences. “Vulnerable women in these situations will be far less likely to seek the medical help they may urgently need should something go wrong,” she said. Sarah McCarthy, also an ARC spokesperson, said that the legislation will “not address the needs of women facing emergency medical situations” citing the case of Savita Halapannavar, the Galway-based dentist who died last October. A HSE report published recently said that the law relating to terminations in Ireland was a “material contributory factor” in her death. “This legislation would most likely not have clarified the procedure enough to save her life. 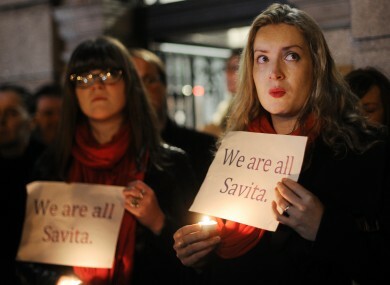 It is simply not acceptable that women in situations like Savita will still be left to die in Irish hospital beds,” McCarthy said. The ARC said it would attempt to have the Bill amended to address the issues it has raised. The legislation is set to be voted on in the Dáil next week before it goes to committee stage. The government hopes to have the legislation enacted by the summer recess. Email “Abortion Rights Campaign says it cannot support the abortion bill”. Feedback on “Abortion Rights Campaign says it cannot support the abortion bill”.